﻿﻿﻿﻿﻿﻿﻿ Why I wrote "How To Rescue Failing Software projects"
"How To Rescue Software Projects - Practical Proven Methods That Work" is a 134-page book based on my own personal experience in turning around projects, avoiding software project failures, and how I used a five step formula to successfully accomplish my mission. Have you ever managed a software project from the beginning that started so well and ended up in a mess? Have you ever wondered how a software project in deep trouble can be rescued? Have you ever wondered what other project managers would do when their projects are over budget, delayed, have growing scope, and no progress made on a daily basis? Project managers always feel alone and isolated in projects. It is as though no one understands the pain they undergo. They face challenging situations and demands from their customers, whilst balancing with the need to complete the project on time and having to steer the project to its success amidst conflicting priorities. I wrote this book to share my experience in how I used my five step formula to rescue failing software projects. When I had to rescue failing projects, I could not restart the projects. We were in the middle of a project gone wrong. Each passing day was overwhelming and fraught with a seemingly unending list of major issues, saddled with an overworked team who were about to give up. My career was on the line and no one could advise me on how to rescue such a project. My hope is that the information in this book will serve as an inspiration and be useful to those in similar dire situations. There is always light at the end of the tunnel. Although the information in this book pertains to software projects, I have come to realize that the techniques can be used in many other situations. I have personally used these techniques in business and technical projects. In this practical, non-theoretical book based on real-life examples, you will discover logical, hands-on, and proven methods that could turn your project around and put it on track toward success. With international experience in the software engineering arena, Bernard understands the risks and difficulties of software projects, as well as the physical and emotional stress they create for dedicated men and women struggling to save the project. This book provides a roadmap consisting of five steps. 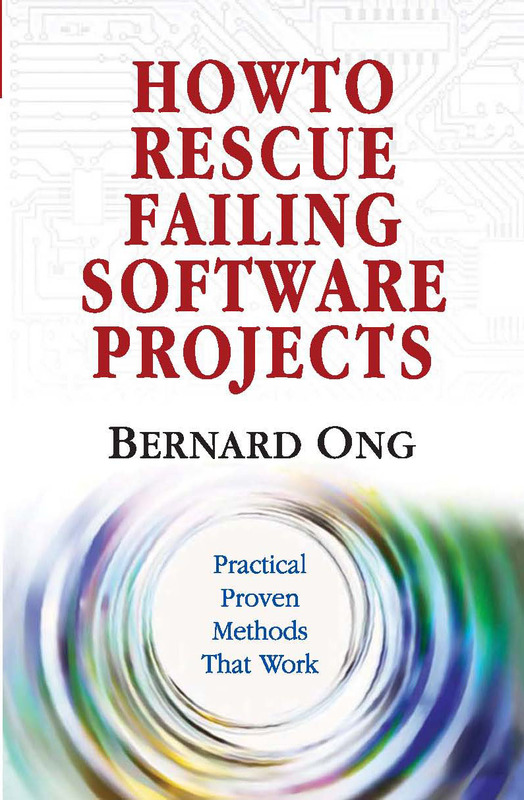 The rescue is based on the author's own rescue formula, which he has successfully used to rescue troubled software projects. Lessons from this book can also help all project managers to understand why strict project management processes are critical to their success, in both new projects and in turnaround situations. Following the five-step rescue formula will increase your chances for success. He has another blog at here.